Kontera has now been acquired by Amobee and is called Amobee. Amobee offers in-text advertising links, similar in style to the more popular Infolinks. While their ad units’ high visibility might be off-putting to some, that is exactly the point: these ads are effective combatants against banner blindness and are impossible for a site visitor to ignore (assuming he is reading the content). While in theory this is a good idea, in practice it leaves a lot to be desired as implementation can be choppy and ad relevancy can be weak. Overall Rating: 2.25 out of 5. 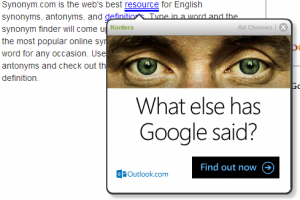 What We Like: In-text ad units are less susceptible to banner blindness. What We Don’t Like: Implementation is slow, in-text ad units look spammy, ad relevancy is weak. Publisher Terms: Presented on sign-up. Amobee Tech Implementation Rating: 1 out of 5. 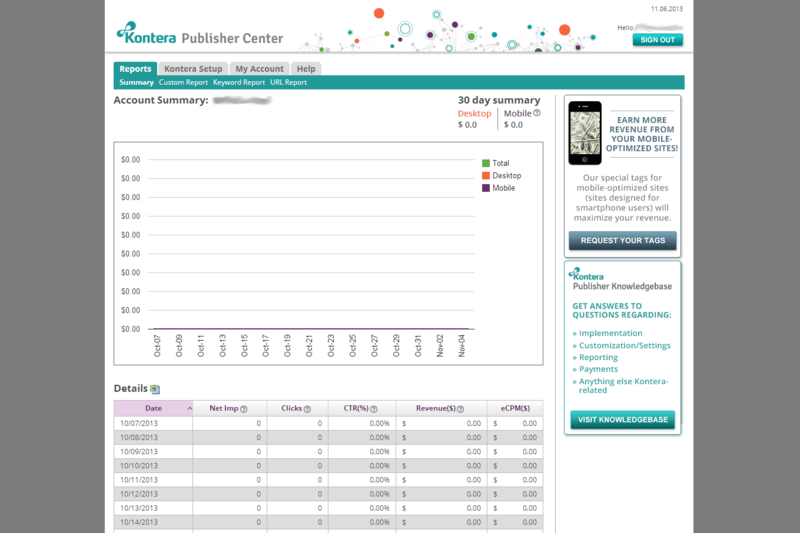 Amobee Publisher Reporting & Admin Control Panel Rating: 2 out of 5. Control Panel: With top navigation for Reports, Setup, My Accounts, and Help, the Amobee publisher control panel is easy to navigate. From the control panel, a publisher can find the ad tag code to implement on a website, pull up performance reports, and tweak account settings and payment information. Reporting: The reporting console satisfactory, though somewhat incomplete. The main summary report on the dashboard defaults to showing a 30-day summary with breakdowns by desktop vs. mobile. And while there are options for creating URL and keyword reports, only the previous week’s statistics are available for these reports. There are also custom timeframe summary reports available as far back as the date of account creation, but it is not possible to drill down by URL or keyword for these reports unfortunately. Amobee Payment Rating: 4 out of 5. Publisher’s Share of Revenue: 50%-70%. Payment Methods Available: ACH, Check, PayPal. Amobee Account Help Rating: 2 out of 5. Easy to Contact Support: Yes, but response time is slow. Amobee carries the promise of contextual in-text ads that are less prone to banner blindness than traditional display advertising that you may encounter through Google AdSense. But unfortunately, it falls well short of expectations. Like most of the other networks that employ in-text ad units, Amobee’s biggest downside is its low ad relevancy. Couple this with a poor tech implementation experience and limited control over the types of ad units displayed, and there isn’t much that is redeeming about Amobee. Amobee offers only one type of ad unit: the in-text double-underlined link of a site’s normal text that when hovered over displays what is supposed to be a relevant ad. The trouble is that more often than not, the ad unit that pops up is far from relevant, which certainly leads to low CTR and therefore low revenues. For example, on my test site, I have an article about open source alternatives to proprietary software programs. The first keyword in the article that the Amobee script decides monetize is “Linux”. Hovering over that word displays an ad for Verizon’s 4G LTE network — not a great match. A bit further down that same page, the keyword phrase “portfolio management” is monetized. Hovering over this double-underlined link displays an ad for Charles Schwab’s trading services product — not an unreasonable match if viewing that single phrase in a vacuum. But when one considers the context of “portfolio management” in this particular article indicates a very different definition from “wealth management” or “asset management”, there is a disconnect between the keyword and the resulting advertisement in this case. I highlight this example in order to make the argument that Amobee’s monetization algorithm must be very simplistic in that it does not take an entire page’s content into consideration when choosing where and how to monetize certain keywords, but rather it seems to pick and choose keywords at random, with no consideration for the context of the whole page. To verify that the poor monetization on this first article isn’t an aberration, I check a second page on the same site. I discover that Amobee attempts to monetize the keyword phrase “Internet Marketing” with an ad for Mass Mutual Financial Group. Again, a poor match. Bewildered at the indication that I might have to wait another 48 hours (after already waiting four days) to see my site monetized, I nonetheless clicked re-load on my site and to my delight, the Amobee ads were finally displaying, four days after first pasting in the ad code. There may not be another large-scale display ad network out there that requires a four-day wait time and an email to tech support to get ads to begin displaying. 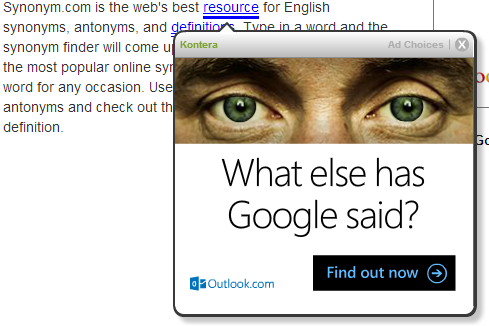 Google AdSense takes maybe an hour; Media.net takes but a few minutes; Infolinks takes a minute or two. In this day and age of instant monetization, asking your publishers to wait up to 24 hours (and this can really mean four days in my experience) is a tough sell. Turning to the control panel and reporting, the reporting system at Amobee is serviceable but feels a bit incomplete. Keyword and URL reporting are only available for the prior seven days. If you want to go back farther than that, the only report available to you is a general summary of the entire site. Metrics include the usual impressions, click, CTR, revenue, and eCPM. The control panel has a nice feel to it and user experience is solid, with easy navigation. But functionally, it is lacking. As stated above, reporting options are somewhat limited. Also, there is no way to add a new site to your account within the control panel; doing so requires an email to tech support, and then approval takes three business days. There is only one ad customization option available within the control panel: link color; and changing this in the control panel only generates a new code snippet that you need to copy/paste back into your website before the change goes live. There is little to complain about with Amobee payment. They offer a decent revenue share of between 50% and 70%, depending on revenue source. And they are able to pay via ACH, check, or PayPal, which should be sufficient for almost all publishers. But I would suspect that the $50 minimum payment threshold is likely to be a challenge to reach for many who try Amobee. Overall, there isn’t much that Amobee offers to make it a worthwhile monetization option. I have yet to come across a good in-text ad network that displays truly relevant ads. But Amobee may be the worst of the most popular options here (including Infolinks and Chitika).